Now, just looking at that table, I have to say my favorite are Unity LA…followed by The Kings. Personally, I think the only reason that Unity LA are lower than the Kings is because JLo had some weird beef with their song selection. That was just…weird. Anyway, let’s take another look at the dances. First up, the redemption winner, Exiles – first their duel performance, followed by the redemption round. Going from lowest score to highest, next we have Fuego Dance Crew. Love how this one started out with the very cool, gravity defying move. Radiance…they’re the shared video of the week meaning that their video is paired with their competition, Main Guys. I loved this routine for its prowling, stalking feel. Excellent. Up next, the Heima – B-boys who seem to have it going on, but they’re not actually in my top three for this group, I don’t think. Okay, changed my mind. I think I actually like them better than the Kings. Kinda funny what happens when you rewatch the dances after the first time. Next up…my favorites, Unity LA. And the dance of the night (for the judges anyway)….The Kings. I totally get the complaint that some had about it seeming like an elite cheerleading squat…but we call professional cheerleaders who show up on DWTS ringers for a reason. 🙂 These guys are quite awesome. So, you have a pretty good idea of my top three….who are your top three. Vote below. 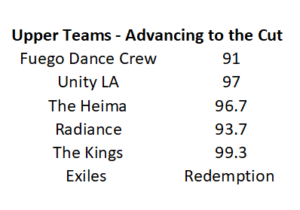 I ended up going with Radiance, Unity LA and the Heima, with Kings nearly tied with them. Who did you vote for?? No responses to "WoD Week 7 Recap and VOTE – Who Should Win the Upper Team Division?? (Poll)"
Commenting policy: Some comments run the risk of being deleted. These include comments that are spam or cannot be understood or are rude. *This is a fan site not affiliated with or endorsed or sponsored by World of Dance Tour or NBC. For the official World of Dance blog publication please visit www.thisiswod.com. Princess Heidi: Thanks Lurker – Good to see you! !